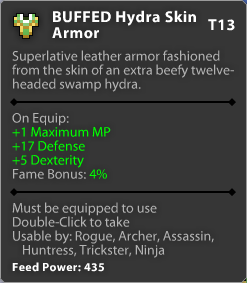 Unlike other leather armors, the Hydra Skin Armor does not provide a defense upgrade from the previous tier; it only adds 1 dexterity compared to Griffon Hide. This has led to the “buff hydra” meme within the community. In response to this, the item was replaced with the “BUFFED Hydra Skin Armor” for April Fools 2017 and the 2018 Easter Event, which provided a mere + 1 MP compared to the regular armor but was otherwise identical. In addition, the words “extra beefy” was added before “twelve-headed” in the flavor text.